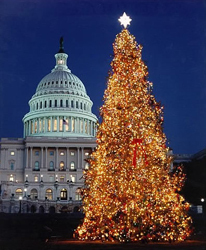 Although to most people the Christmas tree is fondly thought of as a symbol of Christmas, it's no stranger to controversy. In 1851 the pastor of a Cleveland church was condemned for engaging in a pagan practice by decorating a Christmas tree! Puritans actually banned Christmas in New England, and the Roman Catholic Church regarded the Christmas tree as a protestant custom until they realized its spread was beyond their control. Oliver Cromwell preached against decorating Christmas trees on such a "sacred event" as Christmas. And even today some Christian groups, such as the Jehovah's Witnesses, are against the use of the Christmas tree. But it doesn't stop there. In the year 2000 in Eugene, Oregon the city manager declared a Christmas tree could not be put on city property, because it was a religious symbol that violated the separation of church and state. In 2004 in the Bellevue City Hall, their Christmas tree was called a "giving tree" to make "everybody feel welcome". In 2005 the city of Boston began calling their Christmas tree a "holiday tree", and also in 2005 the hardware chain Lowe's began labeling their trees "holiday trees" and "family trees"! In all of these cases there was such strong public outrage that the decisions have been reversed. But the controversy still remains, with some believing the use of the Christmas tree in public places amounts to religious discrimination. Companies including Sears, Wal-Mart, Target, Best Buy, Gap, Pet Smart, and Home Depot have all switched to using the term holiday in place of Christmas at one time or another! You'll even find websites devoted to this topic, such as DefendChristmas.com. If that's not enough, there's also the yearly controversy regarding natural vs. artificial Christmas trees, with some environmentalists arguing that no kind of Christmas tree should be used at all!